So there you have it. A new manifesto for people who appreciate good food and good company. 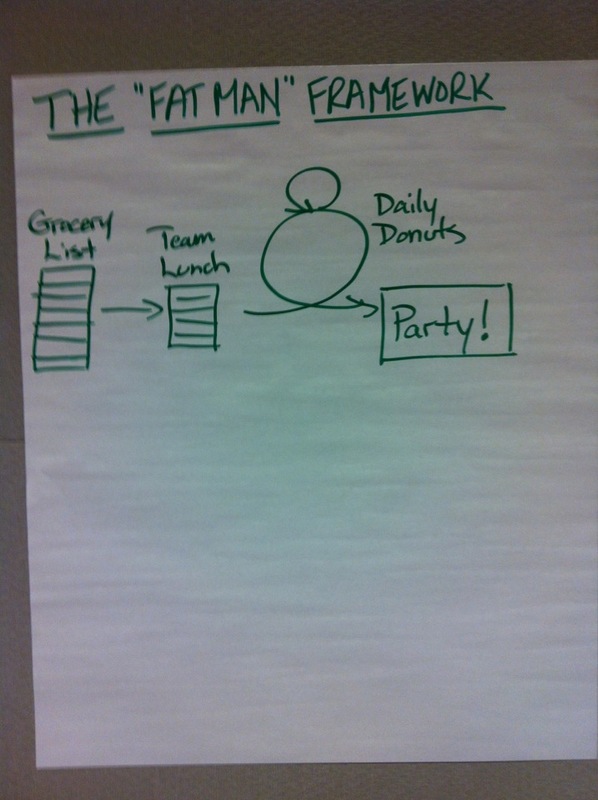 Would this manifesto work any better for teams than the Agile Manifesto? Who knows? I’d be willing to try it out. The fact is that there is nothing really inherently special about writing a manifesto. I’ll tell you a secret: it’s really easy. Anybody can do it. In fact, I think everybody should give it a try! Writing a manifesto is fun, and it gets you thinking about what you really value about the people and the work that you do together. I think there should be a proliferation of manifestos. 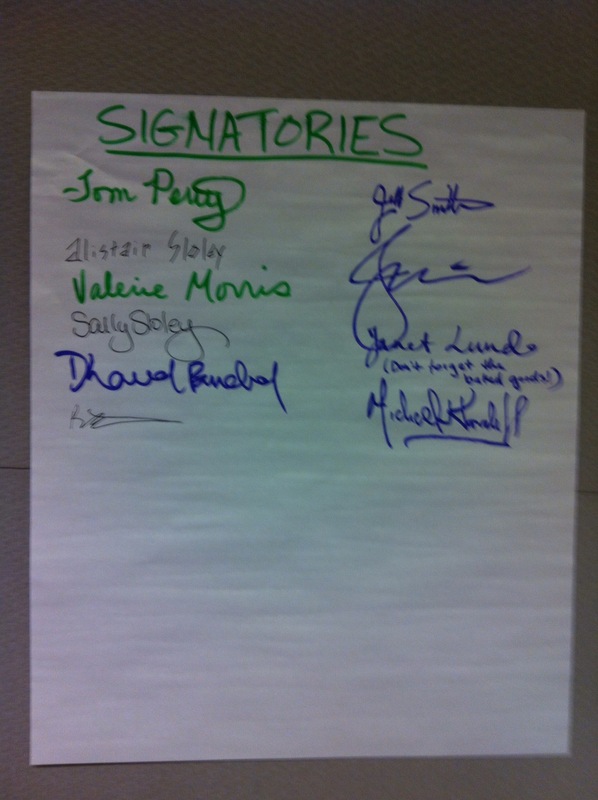 The Fat Man Manifesto is mine, and I even got some signatories! So what about your manifesto? What kind of manifesto would you write? I think this whole “Welcome changing requirements, even late in development” thing is a lot more challenging that I had first anticipated. It was a long week, and perhaps not my best. I pushed myself hard at work and at home. Probably too hard. Soon I discovered that much to my chagrin, it is really difficult to be receptive to changing requirements when you are exhausted. Where is the principle in the manifesto that covers sustainable pace? Oh nuts…that one doesn’t come until week eight! I’m never going to last that long! Well, while I reconsider the wisdom of this little exercise, I wanted to share one more observation: All this thinking and writing about the manifesto has me writing software again. I guess if you talk about it long enough it’s bound to happen sooner or later. So now I have a small integration project that I’m doing for some folks at work. I gave a little demo and asked for some feedback. Guess what I got? That’s right: no requirements changes. I think those hosers are going to wait until the last minute to hit me with the changes! I suppose to some degree that is a natural consequence of the way software tends to evolve. This all reminds me of Brian Marick’s excellent “Agile Stance” talk that he gave at XP2011. He compared agility to ballroom dancing. As he put it, we are all in a partnership with our customers as if we are engaged in a dance where each party may not know exactly what the next move is. This leads to a posture or stance of readiness. We stand on the balls of our feet, we notice the way our partner is leaning, we are looking for the signals that will indicate what the next move should be and thinking about how we react. I think it is a very “present” and alive way of being – and it’s where we need to be in order to be ready to respond to our customer’s changes late in the game. You are currently browsing the Agile Tools blog archives for May, 2012.